What is a .guide Domain? The .guide domain was first introduced in 2014. It was proposed as part of ICANN’s generic top-level domain program. As the extension implies, it was created to be a namespace for instruction and assurance. Since its delegation, thousands of domain names have been registered. Many of them make up a unique hub that includes websites for finding solutions to a wide variety of issues. As a generic domain, .guides is available to anyone who wants it. This has created some unique digital spaces filled with useful information. You can become a part of this informative hub with your very own .guide website. The word “guide” is synonymous with problem-solving and knowledge. You can be a guide for customers or readers by hosting content that’s beneficial to their needs. With a .guide domain, your website will stand out among the crowd. It shows that you’re an authority in your field and you have a lot of information you want to share with people. The domain extension automatically creates a sense of credibility, ultimately helping you grow your audience. 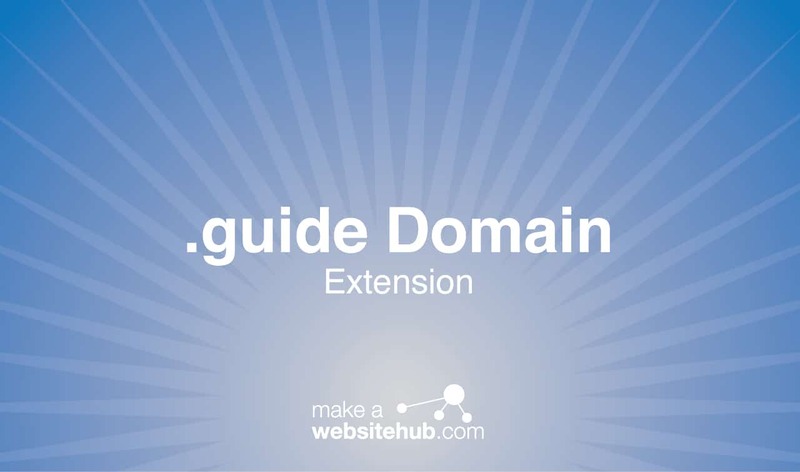 If you’re part of a company or organization, the .guide domain extension can be beneficial to your needs as well. There are many industries that have started using the extension to advertise their products or services to people around the world. One of the biggest to do so is the travel industry. Tour guides and travel agencies can utilize the domain to improve their website’s search engine optimization and gain more web traffic. Therapists may also be able to see success with the domain. There are a plethora of ways to use the .guide domain for your website. How you use it will depend entirely on your business and industry. For example, stores and online retailers can use the extension to advertise niche products. A bookstore that provides self-help books can call their website Literary.guide. A travel agent can name their website after their local travel destination to create a website like LocalTravel.guide. Therapist and mental health specialists can advertise their services through a site with an address like Mental.guide or Spirituality.guide. The .guide domain is a versatile option that can be applied to virtually any business or blog. Just get creative and see what types of interesting names you can come up with. Where Can You Buy a .guide Domain Extension? Most domain name registrars will provide you with a .guide domain. The associated fees are very manageable, even for an individual blogger. As mentioned before, there are no use restrictions to concern yourself with. Simply check out the following domain name registrars to see if your domain is available.